Understanding and taming the costs of diseases associated to the gut microbiota disruption has always been a priority for Da Volterra. In a research paper that has just been published in the Journal of Hospital Infection, the Da Volterra team casts a new light on the true cost of C.difficile infection for the healthcare system. Based on a review of tens of thousands of hospitalizations in the US between 2012 and 2016, the true cost of C.diff infection exceeds 10,000 USD per infection. This is extremely high and is certainly correlated with prolonged suffering for the patients. Preventing the deadly C.diff infections is a priority for Da Volterra! 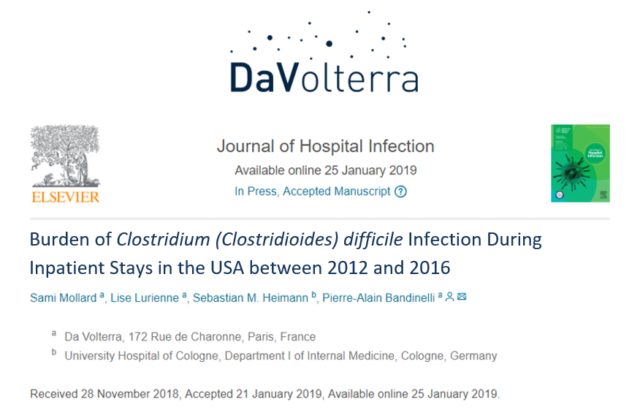 Background: The healthcare burden of Clostridium (Clostridioides) difficile infection (CDI) is high but not fully characterized. Aim: The objective of this study was to assess hospitalization costs, length of hospital stay (LOS), and in-hospital mortality attributable to CDI in the United States by analysing nationwide hospital discharge records over the 2012–2016 period. Methods: A retrospective, observational study based on the Truven Health MarketScan® Hospital Drug Database was conducted, in which 46 097 inpatient stays with a diagnosis of CDI were analyzed. Cost, LOS, and in-hospital mortality were studied for patients with either a principal or secondary diagnosis of CDI (the secondary diagnosis being comorbidity), and for patients readmitted because of CDI. If CDI is a comorbidity, its attributable burden was estimated by realizing a Coarsened Exact Matching (CEM), comparing 17 273 CDI stays with 84 164 stays in a control group without a CDI diagnosis. Findings: Inpatients, for whom CDI was the main reason for hospitalization, incurred a mean cost of $10 528 and a LOS of 5.9 days in average. CDI as a comorbidity caused a 4.4-day prolonged inpatient stay and increased costs of $11 938. CDI also increased an average hospital’s mortality rate by 4.1%. Conclusion: This study is consistent with previous publications, which demonstrated CDI’s high economic burden in healthcare settings and for health insurance systems. When recorded as a comorbidity, CDI significantly increased hospital costs and LOS. These results highlight the need for innovative therapeutic approaches in the prevention and treatment of CDI.